Brand new foot wear for both the men & women! 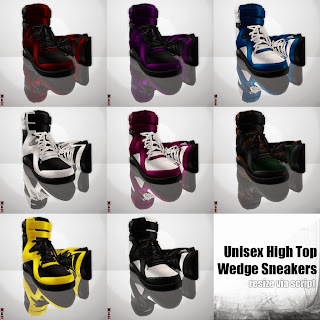 You can find the new High Top Wedge Sneakers in 8 different unique colors plus each package includes both the male & female versions. Plus, something wicked this way comes! Each gender can find a special hidden 1L pumpkin containing a surprise color of the new sneakers! Just find it before the 31st!